Mini Splits are ductless heating and air conditioning systems that eliminate the need for a basement or attic-located evaporator unit and duct work. With thin copper tubing, these units pump refrigerant directly to discreet wall mounted units inside. Even more remarkable, these same units work in reverse in winter, absorbing heat from the outside air and moving it indoors to heat your home. The result? Efficient cooling and heating for year-round, whole-house comfort in any climate. 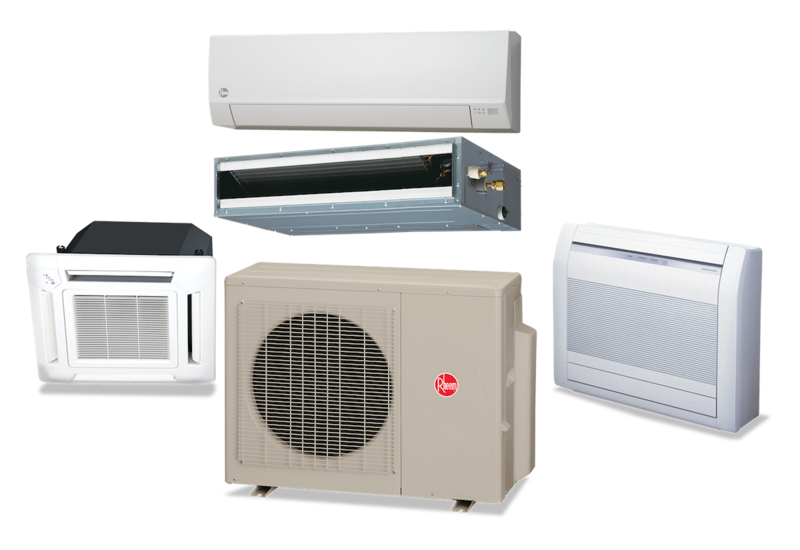 Rheem® Mini Split Heat Pump Systems offer a convenient alternative for heating and cooling areas of the home where traditional duct systems may not be an option. No need for ducting with the Mini Splits! They set up quickly, install easily and won’t take up wall, closet or attic space. This compact system is perfect for attics, home additions, basements or crawlspaces. With a variety of configurations, Rheem offers a both single and multi-zone custom mini split solutions to heat and cool even the most difficult areas.